You will receive news about events, discounts, book reviews, author news and much more! Take I-93 to New Hampshire. Take Exit 23 and follow 104 East. Take Route 3 to Route 25. In Center Harbor, turn left at the first traffic light. Bayswater is located between Keepsake Quilting and the Verizon Store. From the east take Route 25 West, or follow 109 to Route 25 West into New Hampshire. In Center Harbor, turn right at the second traffic light. 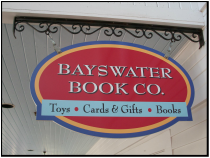 Bayswater is located between Keepsake Quilting and the Verizon Store.